Home » Rangefinders » Breaking 80 IS500 Rangefinder – CLASSIC DESIGN is Back! Breaking 80 IS500 Rangefinder – CLASSIC DESIGN is Back! 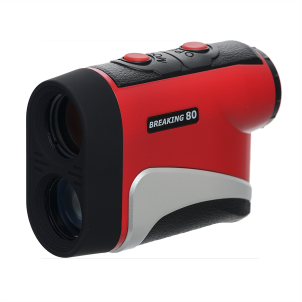 The Breaking 80 IS500 is a reliable, low budget golf rangefinder that is compact and lightweight with 6X magnification. It has IntelliScan for 8 seconds of continuously updated feedback and PinSensor 3 Technology to grab flag distances from up to 200 yards. 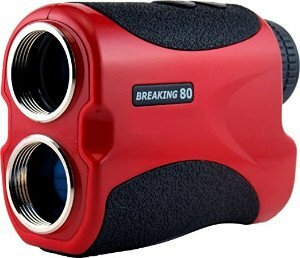 Overall the Breaking 80 IS500 laser rangefinder has great quality and advanced features that are worth more than it’s being sold for. Even though it’s being sold at entry level rangefinder prices, it’s more of a mid-level rangefinder that’s more than suitable for a golf session, even a tournament legal one. Reviewers have given it a solid rating many of them giving it the perfect score. What is the maximum yard range with the Breaking 80 Golf rangefinder? The IS500 models are capable of giving accurate ranges up to 250 yards, -/+1 yard without using any sort of reflectors or prisms. It can range out to about 550 yards which is pretty ideal for a typical golf game. How much does an IS500 rangefinder cost? It’s expected that the price for a Breaking 80 unit can vary depending on the source you’re buying from, but they all have one thing in common – it’s relatively cheap. You’re looking at around paying $150 to $200 for the digital rangefinder. This particular unit is one of the best rangefinders you’ll find in the market for the price. If you want to see the full lineup of affordable to high end rangefinders head over to here. Are there other color options available? Like many other rangefinders on the market, the IS500 does not have a range of color options available. You can buy it in red… or red. For some, color scheme might be important but let’s admit it, color won’t make a difference to your game! What is IntelliScan and does this rangefinder have it? Simply put, IntelliScan is Scan Mode. The IS500 does come equipped with Scan Mode as a standard feature. 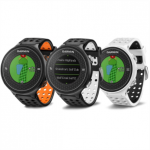 While you’re out in the field you can receive constant distance updates for eight seconds at a time for an idea of where trees, water hazards, and bunkers are all located. Does the Breaking 80 have a flag sensor mode? It wouldn’t be a good golf rangefinder if it couldn’t pick up a flag stick for your game. Not only does this unit have a flag sensor mode, it’s been revamped from its original design to include the 3rd Generation Pin Sensor software. Overlapping targets, background brush, and other distractions are no longer a nuisance. Flag seeker technology is First Target Priority Mode in all its glory. How can you maximize 3rd Generation Pin Sensor software? A lot of people seem to get inaccurate readings due to user error. Yes, read that again – user error. Getting the most out of the features means knowing how to use the rangefinder to its full potential. To maximize the advanced pin sensitive first target priority mode, aim the cross hairs to the background and hold down the firing button to receive a distance to background objects, say the trees. Without letting go of the firing button, move the cross hairs onto the pin and you’ll get an instant distance reading. Even moving the rangefinder away from the flag stick will not change the reading since it displays the nearest object – the pin. 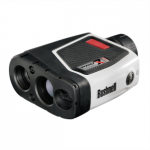 What are the optic specs of the laser rangefinder? Cheaper laser rangefinders are typically made with 4X magnification, so you’d expect that of the Breaking 80 line too right? Wrong! The B80 unit comes with 6X magnification with 24 mm objective diameter lens. You’re actually getting optic specs that you would typically pay around another $200 for. The unit is solidly made and water resistant to boot. It’s waterproof enough to last a session out in the rain, but you’re not going to want to toss it into the pond during a fit of rage. It’s not going to survive submersion. On the flip side, to get a waterproof unit for around $100 is extremely great value. Does the rangefinder have manual or auto focus lens? Although this new design includes better eye-piece durability and improved lens protection, the rangefinder only has manual focus adjustment. Even though this may sound like a non-issue, if it had the auto focus feature it would be one less thing to think about during the game. Breaking 80 offers a 30 day money back guarantee and a one year warranty on the IS500 unit. The one year restriction could be a downside since warranties are usually offered for much longer than that from other brands. However, for the price of this unit and the satisfaction reviews from its customer base, it’s still a pretty good deal. There is the option of using the lifetime warranty, but that only gets you another unit at a discounted price. Update - 2017.06.20Breaking 80 is now offering a lifetime warranty on models sold after March 1, 2017. To ping up the strokes, the Breaking 80 IS500 has been revamped to the old, wider design that was in popular demand. It does more than please the crowd, it earns a loud and proud standing ovation for performance. It’s right within the ideal price range for someone looking for a unit today. But, if you want slope, the VPRO500S by TecTecTec takes things to a new level with angle compensated distances. Right in the same budget is the Nikon Coolshot 20. It measures out a little bit further and is a solid rangefinder on the green. But, when giving the underdog brand a go, you won’t be disappointed. There’s a Breaking 80 golf rangefinder for you if you’re ready to break 80!